Roughly three months ago, I wrote a post noting that Founder Labs was coming to NYC. 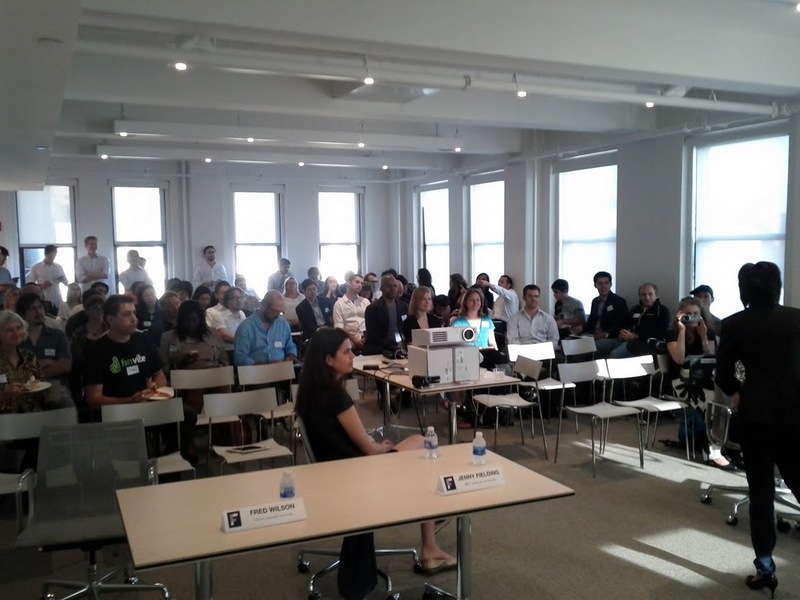 Last night the first Founder Labs program in NYC wrapped up wtih the final presentations in USV's event space. I have liked the idea of Founder Labs from the moment I heard about it. It sits between things like Pair Up and Startup Weekend and Y Combinator and TechStars. Founder Labs helps pair up three and four person teams, coaches them through ideation, all the way to a prototype. And they do this in a five week intensive class that meets on nights and weekends so you don't have to quit your job to do it. The Gotham Gal and I were active mentors in the Founder Labs program, meeting with the teams once a week at space hosted by Google NYC, and also provided support for the NYC program along with a few other awesome people and companies. Founder Labs creator Shaherose Charania is a force of nature. She handpicks the participants in the program and helps to form the teams. I told the assembled group last night that the teams that are formed at Founder Labs are terrific. They are diverse, well balanced, and highly compatible. Each one has engineers, designers, and product talent on them. I have never seen a program create teams as well as Founder Labs does it. If you want to do a startup but are having a hard time finding a team to do one with, you should really consider Founder Labs. The next program is in SF from Aug 11 to Sept 22. But I am certain Shaherose and her team will be back in NYC before the end of the year. The first NYC program was so strong and there were are least two teams, maybe three that will come out of it with real traction. The winner last night was Smarketplaces, a project to put ebay/etsy style marketplaces on blogs like Disqus has done with comments. It has great promise. Authy was also quite strong with a user side solution for simple and easy two factor authentication. There were two interesting projects around alternative medicine services and helping people with food allergies navigate the world of food. We also saw new ideas in social music and daily deals. Regardless of whether all of these teams turn into startups and businesses (I think several will), all the participants will come away with an appreciation for how to get a startup off the ground, what makes a great team, and how to quickly find out if your idea is a good one. And because of that, Founder Labs is a winning formula. I made a friend online today. It happens to me most every day. Tyrone lives in Cape Town South Africa. The first time I came across Tyrone in the indie while you work room at turntable.fm, he was chatting up a couple Japanese DJs. I loved that exchange so much that I tumbld it. It speaks to the notion that music is the international language. 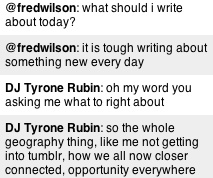 Tyrone didn't mean "not getting into Tumblr", he actually meant "not getting into Turntable.fm." That's because Turntable.fm had to turn off international users last weekend due to licensing issues. Tyrone had been chatting about how big of an impact that had on him earlier in our chat. To me the big change is that socialization is now possible on a global real-time scale. This is not a technological revolution, but a social and behavioral one. That flattening is a ramp for cultures to meet and communicate over cross cultural, uni-behavioral drives like music or sw development or celebrity obsessions or just passion points like wine or art or even, in my work, marketing. Whether it is Tyrone chatting up a couple of Japanese DJs or talking to me about what to blog about, "socialization on a global real-time scale" is a big deal. I don't understand all of this tweet, but I know who he is talking to/about and I can click on the picture and that tells me most of what this tweet is about. I can stay connected to @masason at some level via Twitter even though I don't understand the words in his tweets. I followed Tyrone's Tumblr this morning. Now every time he tumbls something, it will appear in my dashboard. We stay connected even though we live half way around the world from each other. I hope turntable can get licensed internationally because Tyrone also is a great DJ and I love getting turned onto new music by him. Content licensing issues are certainly one of the few remaining hurdles in our increasingly global, social, and mobile web. I'm optimistic that we'll see these hurdles come down soon because the power of this global network is large and getting larger every day. Content owners should want to tap into it as much as individuals like me, Tyrone, and Masa Son. As a self proclaimed Android fanboy, I thought I'd talk about a couple things I'm excited about in Android land. 1 – Android is seeing 500k activations a day and that number is growing 4.4% week over week. More users means a stronger platform and hopefully more and better apps. I've added at least a dozen awesome android apps over the past few weeks. 2 – We've got a new flagship Android handset coming out. I love my Nexus S but the new Nexus Prime seems even better. I love the idea of scrapping the menu buttons from the bottom of the device and replacing it with more screen real estate. I also love the idea of naming a phone after a transformer. Over the past six months I have watched my wife and two partners move from Blackberry to Android. None of those decisions was easy and without some pain. But I think they are all quite happy with the decisions and the Android platform. The Gotham Gal couldn't imagine a phone without a physical keyboard so she is on the HTC G2. One of my partners is on the Nexus S and the other is on the orignal Nexus. I'm going to get him a Nexus Prime when it comes out. It is fun being on a platform that is growing rapidly, improving with every software build, and attracting lots of new developers and applications. Last week's financing options post was about getting your customers to finance your business. This week's post is about getting your suppliers to finance your business. Truth be told, this is not very common in the startups I work with. The more capital intensive your startup is, the more you can and should think about this approach. Two reasonably common examples of vendor financing in the world of tech startups are equipment financing and development for equity. Equipment financing is when a vendor of capital equipment, like servers, agrees to sell you their product and takes a loan or a lease instead of cash. We are going to do an entire post on capital equipment loans and leases later in this series and we will cover that in more detail then. Development for equity is when a third party development firm builds something for you and takes equity in your business (or less commonly, a loan) in return for the development services. It is fairly common for a development partner to take some of their compensation in equity but it is rare for them to take all of it that way. But in this case, a vendor of services to your company is financing your business by reducing the amount of cash you need to lay out to get into business. In the biotech and cleantech sectors, vendor financing is more common. These sectors have large capital equipment requirements and large third party services requirements. There is a lot of money laid out to third party vendors on the way to cash breakeven and therefore a much greater opportunity to have those vendors finance the business. When you are starting a company, cash is always tight and so anytime you need a third party vendor to supply your company with services, you should be thinking of vendor financing possibilities. It can be a great way to keep your cash outlays down when the cost of capital is highest. That's how Skype's option plan is described in this piece by Felix Salmon. I've seen option plans that have repurchase rights in them. They used to be more common twenty five years ago when I entered the venture capital business. The theory was that employees would have to stay until the exit if they wanted to keep their equity (be in it to win it). But in practice, once employees realized that was the deal, they were actually incented to leave because they didn't trust that the equity they were vesting would ever produce a payday for them. So they went elsewhere and created value for an employer with a better deal. Today, the "market" deal in employee option plans is that employees have to exercise their options within some period after leaving (typically 90 days). This is a better deal for the employee than a repurchase right but can still create hardship for employees as it may cost real money to exercise and there are often tax issues with exercising options. This requirement to exercise upon departure is a big reason why the secondary market in employee common stock has taken off. Employees who leave companies need to sell some of their vested stock to come up with the cash to exercise and pay taxes associated with exercise. This is a tricky area. Companies feel that employees who stay and work to create ongoing value should have a better deal on their vested options than employees who leave and go to work elsewhere. I understand that point of view. But it is also true that your employees need to feel that the options they are vesting are going to be worth something and that they will be able to keep them when they leave. Companies also want to control their stock and keep it off of secondary markets where they can end up wtih shareholders who they don't know. The requirement to exercise within a short period of departure is in conflict with the desire to control the cap table. I believe this whole area of "what happens with the options when the employee leaves" needs to be rethought in light of where we find ourselves right now in startupland. I'm not sure I have any particularly good ideas but I know that the way we do it right now is problematic for everyone. I got an email from my friend Robin Chan this morning. He's in Beijing and attended a hackathon sponsored by our portfolio company 10gen (developer of the open source datastore MongoDB). He said the developers in Beijing were showing their love for Mongo and building some great web apps with it. The top regions for searches on MongoDB are Russia, South Korea, China, Ukraine, Sweden, Israel, India, and then the US. The top cities are Beijing (Robin was right), San Francisco, Moscow, Shanghai, Stockholm, and NYC. The top languages are Korean, Russian, Chinese, then English. MongoDB is becoming a very popular datastore for new web and mobile applications. So this is a crude proxy for where the new web and mobile applications are being built. When people ask me what the biggest trend on the web is, I tell them globalization. Web services are being used globally and they are increasingly being built globally. There is no place in the world that has a lock on talent, ideas, and execution. Web development is a global phenomenon. Roughly a month ago, I wrote a post outlining why the Protect IP act is bad legislation. We got a significant amount of outreach from that post from colleagues in the venture capital business who are equally concerned about the chilling effect such legislation would have on innovation in the tech sector. Venture capitalists are notoriously apolitical. We believe in markets. We are not asking for tax breaks or favorable regulatory rulings, we are asking for restraint. The group of venture capitalists who joined us in expressing concern about S. 968, the PROTECT IP Act ("PIPA") represent a broad range of political views. We share a passion for start-ups and a conviction that young companies are a fantastic source of productive innovation. This group is responsible for a significant amount of investment in the U.S. economy. The signatories to this letter work for firms that manage over $13B. We are early investors in services like Facebook, Twitter, Zynga, Skype, Groupon, LinkedIn, Tumblr, Foursquare, and a host of other important web services. The services we have backed now reach over a billion users. We believe that policy makers understand the importance of this sector of our economy. We hope they will address our concerns. If you'd like to join us in expressing your concerns to congress about Protect IP, you can do so here. You can also voice your concerns at Votizen. So using the math I laid out yesterday (roughly 1,000 startups funded each year by VCs), this means that on average between 1% and 3% of venture funded startups get to an IPO. To recap, 1-3% get to an IPO and 5-10% get to an M&A exit over $100mm. 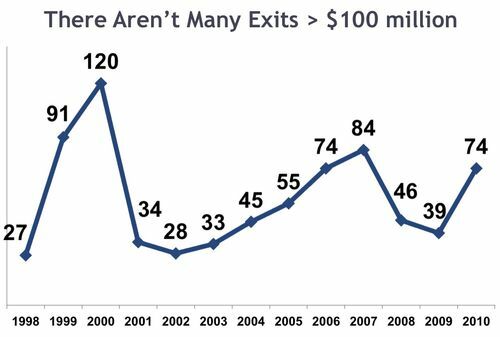 So 85-95% of all venture backed startups will either fail or exit below $100mm. I am certain the VC industry is not using this probability of outcome in setting valuations right now. I was reading Mark Suster's latest blog post (actually its a presentation embedded into a blog post) and I came across this slide. I don't know what the source of this data is and I don't know if this is just M&A exits or if it includes IPOs as well. It really doesn't matter for the basic point that Mark is making with this slide. Based on the NVCA statistics on the venture capital industry, there are on average 1,000 early stage financings every year. I suppose a few of those 1,000 financings are for the same company, but I doubt that many are. So we can use 1,000 as an approximation of the number of companies that get funded in a given year. 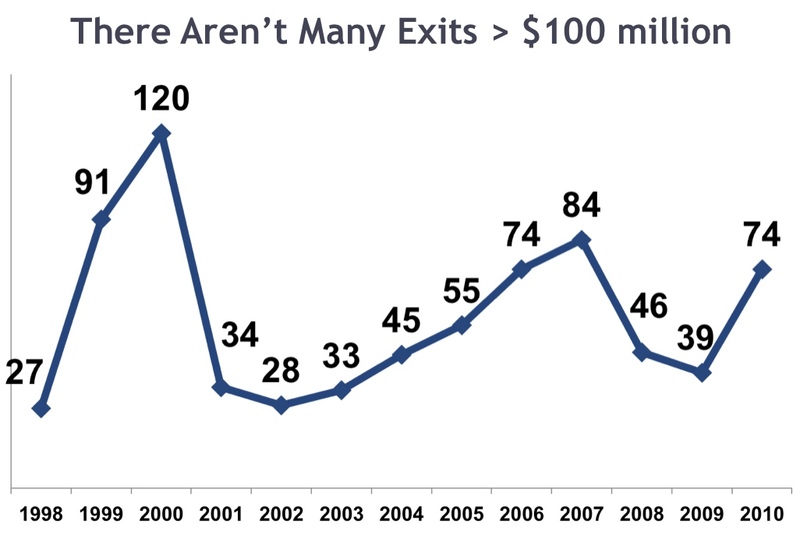 And somewhere around 50 and 100 of them exit for more than $100mm every year. So 5-10% of the companies financed by VCs end up exiting for more than $100mm. At at time when the average Series A round is now north of $20mm (based on very anecdotal evidence and not at all scientific), this poses challenges for the VC industry. The real math is a lot more complicated because of follow on rounds and such, but in order to keep this simple, let's assume all Series A deals are done at $20mm post-money and 5% of them end up exiting for north of $100mm. And let's assume that the average valuation of the exits north of $100mm is $250mm (I think that's a good guess but it could be off). That means you don't get your money back on your entire 20 investments with the one that has a good exit. The simple math is 20×20=400 which is greater than 250. If the average valuation of a Series A deal is $10mm, then the cost of 20 early stage deals is 20×10=200 which is less than 250. That means the winner pays for the rest of the deals. And that is the model that I know works in early stage VC. Anything else is going to be challenging for the industry. Are we in a valuation environment that is challenging for early stage VC investors? Yes. It seems like every day I'm inspired by someone throwing caution to the wind and just going after their passion. Today, it came from this video below. "For two years I had the perfect solution in my head and finally last April I quit my job as an engineer and decided to create the solution myself"
PS: I just realized (via a RT on Twitter) that this is the perfect example of yesterday's post in action.